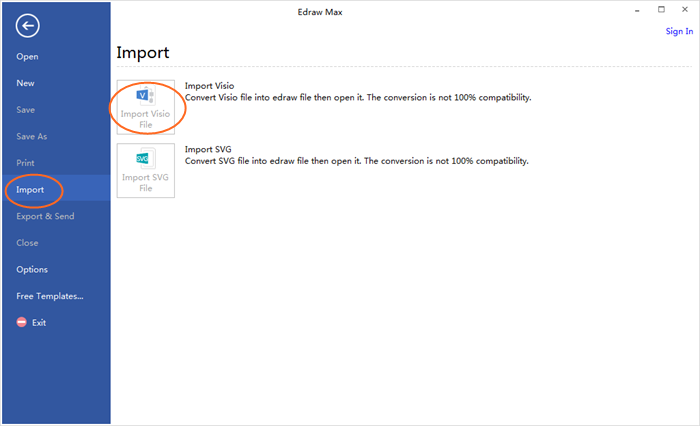 Edraw Max is a great Visio viewer to open and view Visio vsdx files both on Windows and Mac. Microsoft Visio® , a powerful drawing software, is widely used by architects, engineers, project managers, financial worker to create flowcharts, block diagrams, business process illustrations, graphs, networks, floor plans, etc. With the update of Visio 2013, a new file format .vsdx has replaced the Visio previous binary file format .vsd and XML Drawing file format .vdx. The Visio new VSDX file is the combination of a ZIP archive package and mainly XML content. For common users, there is no need to purchase Visio, it is complex and expensive. You may get stuck in trouble when someone sends you a .vsdx file. No worries, we have prepared solutions for you. Edraw Max, an all-in-one cross-platform diagram software, offers a great way to open and view Visio vsdx files both on Windows and Mac, which enables users to open, view, edit VSDX files and even transfer them back to Visio. Step One: Run Edraw Max. Step Two: Go to File>Import, select “Import Visio File”. Step Three: Brower the .vsdx file on your computer, and then click “Open”. Like Visio, Edraw is fully compatible with Microsoft Office. Adding Edraw drawings to Word documents, PowerPoint presentations, or other Office documents is as simple as Copy and Paste. Drawing does not need to start anew. Just drag the ready-made shapes from the library pane and drop them on your page. Edraw makes it easier than ever to draw various kinds of diagrams. Edraw Max is a fraction of the cost of Visio, and our licensing plan is more flexible. There are no "software assurance" fees required to get upgrade pricing in future years with a lifetime upgrade guarantee. Your license is perpetual and you are assured of upgrade pricing for future releases.